Do you have a stylish bed frame and a dreamy mattress, but feel like your bedroom is still missing something? A headboard could be the finishing touch you need! Transform the look of your entire bedroom with an upgrade to a stunning headboard. MyDeal have a vast range of bedheads to choose from for any size of bed, including upholstered headboards, freestanding bedheads, leather bedheads and bedheads for ensembles. Whether you’re looking for a statement bedhead to add life to your minimalistic frame or a classic bedhead for your ensemble to add cohesiveness to your bedroom suite, MyDeal’s range will please. We cater to all style preferences, from classic wooden bedheads to more intricate designs for those wishing to add impact to their rooms. Whatever your tastes, MyDeal can help you achieve the perfect look well within your budget. It’s time to treat yourself to the upholstered bedhead of your dreams! 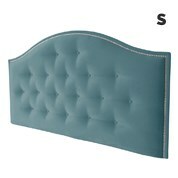 The primary function of headboards is to be comfortable, but they also add a hit of style to any bedroom. While providing cushioning from an otherwise cold and hard wall, upholstered bedheads also add a level of luxury to your room. The perfect addition to your master bedroom, luxurious guest room or even the children’s rooms, MyDeal’s headboards are designed to please. After all, what’s dreamier than a headboard? You can lean back and enjoy the book of your choice, a gorgeous cup of tea or a series on Netflix, all thanks to the comfort and support provided by your headboards. From freestanding headboars to bedheads for ensembles, make the smart investment with MyDeal. MyDeal knows that bedrooms should be designed for rest and relaxation. To simplify your shopping experience, we make sure to stock everything you’d ever need to get your bedroom up to the state you simply won’t want to ever leave it! Our bedheads are available as part of bedroom suites, or you can choose to mix and match from our range of bed frames, mattresses, side tables and tallboys. 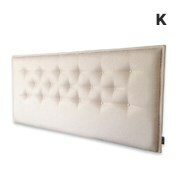 This allows you to create impact by way of a feature headboard, or to keep everything cohesive and classy with a matching set. Browse our range of incredible bedroom furniture today to find the products you’ve been dreaming of. 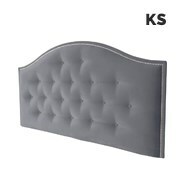 This product is excellent value for the price Its well made and lookd great. Product colour is darker than as shown online. The product was great for the price. Arrived after a few business days and easy to assemble. The product was ok but it was damaged when I received it. Good for what it is, very rudimentary. Quality is good, not great. 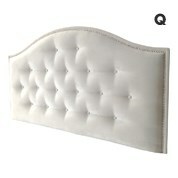 The headboard is very elegant. I like the style and feel of the fabric. You can see in the photo it is mid grey but it’s actually dark grey which was disappointing. The legs are metal and therefore would be rubbing against a painted wall as well as the connecting bolts. I had to tape padding over all that to avoid the wall being damaged. From the front it is a nice piece of furniture though I did want a mid grey so the picture is not accurate. Exactly what we wanted and at a very good price. Cardboard carton was slightly torn in transit in one corner but internal packing was sufficient for it not to impact on the bedhead.Great buy! Excellent buy- looked and felt exactly as shown in the pictures.